When studies began to show the potential health benefits of moderate alcohol consumption, social drinkers across the world raised their glasses to toast the good news. The guilt of opening that second bottle of wine on date night begin to fade away, and grabbing a beer with buddies after work suddenly sounded like an even better idea. However, before you start knocking back a few too many a bit too often, you should first make sure you understand the concept of moderation and the health-related pros and cons of alcohol consumption. Moderation can mean different things to different people, but the general consensus is that two to three drinks per day is considered moderate for men, and one to 1.5 drinks per day is moderate consumption for women. One glass of wine, one shot of hard alcohol or one bottle of beer is considered one drink, but it is important to keep in mind that most people over-pour when filling their glass, particularly when it comes to wine, so what most people think of as one drink is actually more like 1.5 to two drinks. Now let’s have a look at some of the positive and negative effects alcohol consumption can have on your health. 1. Red wine can lower cholesterol. 2. Small amounts of alcohol can reduce blood pressure, which can reduce your risk for stroke and heart disease. 3. Alcohol, particularly beer, is a mild diuretic, which can be beneficial to folks dealing with chronic inflammation or high blood pressure. 1. The diuretic effect can lead to dehydration. 2. 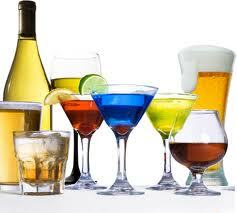 Alcohol consumption can interfere with prescription and over-the-counter medications. 3. While it might help you fall asleep faster, you are more likely to wake up throughout the night and not get the good sleep your body needs to thrive. 4. 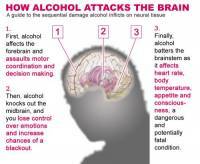 Because alcohol thins blood, it can worsen certain types of strokes. 5. Anything more than moderate consumption on an occasional basis can increase your risk for alcohol poisoning, liver disease, high blood pressure, heart disease, birth defects, cancer, dementia, pancreatitis and depression. Drinking too much can also lead to careless behavior, violence and accidents. All of these can lead to injuries or compromise your health. The key to enjoying a drink around the campfire or a glass of wine with dinner is moderation. As long as it really is just a drink or two around the campfire or one to two glasses of wine in the evening, studies indicate that you can likely avoid the negative effects of alcohol and improve your health while enjoying a drink now and then.